Here at Painting with a Twist we love to host private parties! Bachelorette parties, birthday parties, bridal showers, corporate events, holiday celebrations, kids' parties, and more! We are a party waiting to happen! Just need an excuse!! 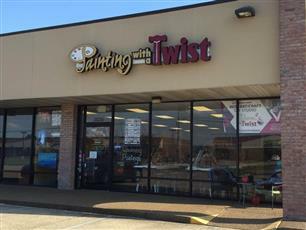 To book your party, just email us at studio136@paintingwithatwist.com or fill out the party request form below. We require a minimum of 8 painters, but can accommodate up to 48! Parties must be booked at least two weeks in advance. You get to choose your paintings, request your favorite artist and we will do our best to make sure that they can work your event! All our events are all ages and they cost exactly the same per seat as our public classes. We can also do off-site parties, but the environment is certainly more fun at our studio. For off-site parties we require a minimum of 15 guests. We may also charge a travel fee based on the location. Our typical travel fees are $150. These could be waived if the size of the group is bigger than 20. Host a unique party for your child's birthday, Scout Troop, sports team, or dance class! Kids love painting here and they also love our dance breaks! Plus, kids leave with their complete masterpieces, so there is no need to come back and pick them up at a later date. Kids Classes (<12) generally run for $25 a canvas. Kid parties are available any day or evening of the week..
· Cupcakes and Cookies will be set up before you arrive for your party! $305 for 8 painters including the birthday person. The Guest of Honor receives a free handpainted, custom keepsake that their friends can sign at the party! $385 for 8 painters including the birthday person.